This seems to be happening as frequently in 1.0.15.0 as it was in the previous few subversions, but basically the game will occasionally lock up and become completely unresponsive while system RAM entirely fills up with Astroneer memory. Rapidly, the paging file will fill up too and the Windows becomes unstable as programs needed to keep the UI running get shoved into the page file. Easy to fix by closing the application as soon as it freezes, or within a minute or so, but this means there's no crash to report; if I disabled the page file it's possible the game might complain about a lack of memory and get closed out, but I don't know if this is Windows stepping in or not. It seems to happen randomly, with no warning. It's happened once while idling on the main menu on the steam friends tab, once when plugging an RTG and four small batteries behind an extender into a gateway engine, once when joining a game right after hearing the 'canister being plugged in' sound before anything even showed up on the screen. This definitely isn't a frequent bug though, and I haven't found anything obvious that causes it to happen, besides seeing some really crazy numbers for system memory. 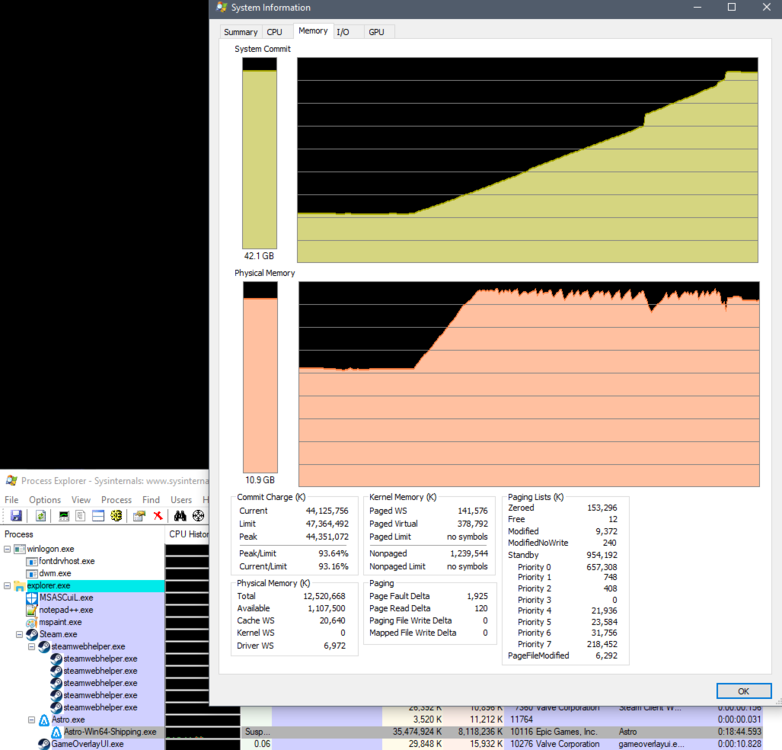 In the first image, the game locked up the computer enough that I had trouble suspending the game in order to take the screenshot, but Astroneer had gobbled up 35GB of system memory which was being represented almost entirely in the page file. In the second image, the game only froze for brief 1-2 second intervals, but sucked up hundreds of MB of memory in the frozen interval at a pace identical to the freezing bug before I closed the application. Basically, the game's memory allocation doubled in the space of 30 seconds @_@. I'm hazarding a wild guess this might have something to do with playing sounds, but I really have no idea besides that the game seems to be stuck in a loop which invokes allocating memory for some purpose or another from which it is occasionally unable to complete.